Label Feel Ghood Music Is In Full Force; Yoon Mi Rae’s Angel Becomes A Hit! Tiger JK, Yoon MiRae, and Bizzy are all individual hip hop artists and have unique characteristics. However, when they come together as MFBTY (My Fans Better Than Yours), they produce incredible synergy as if they have been together since the beginning of time. When they perform on stage, their teamwork is perfect. Often called “The Godfather of Korean Hip Hop,” Tiger JK sounds as though he is the type to be shouting orders to his fellow hip hop artists, but this cannot be further from the truth. In fact Tiger JK, (especially in front of his colleagues) is an affectionate person. The reason why everyone understands each other so well in MFBTY? Respect, compassion, and teamwork. These three artists established their label Feel Ghood Music over a year ago. However, they are now revving up their music engine. The writer of this article met MFBTY at a café in Tong-E-Dong, Jong Gu. Their start is very simple. MFBTY originally started from a basement studio in UiJeongBu, but they recently moved their office to a semi-basement space within another building nearby. Yoon Mi Rae’s “Angel” became an instant hit and was nominated for the #1 spot on MBC’s Music Center despite MFBTY not making any recent TV appearances. Feel Ghood Music members were sighted attaching stickers on to the promotional CDs recently, showing they are very proud of their work. They represent themselves as an indie label, but Yoon Mi Rae has taken the spotlight lately. There is a comment seen time and time again about Korea’s top 3 rappers: Yoon Mi Rae, Yoon Future (Mi Rae is “future” in Korean), and Tiger JK’s wife. Yoon Mi Rae is an acclaimed singer as well, with her songs in drama OSTs (e.g. Touch Love) reaching #1 on charts. This is the same Yoon Mi Rae who happily packs lunchboxes and takes her son Jordan to school every morning. “I had 8 birthdays so far (due to his birthday being on February 29th). I’ve had many trials and tribulations in my lifetime,” these are Bizzy’s lyrics from the song. They relate to his life story about how he crossed the sea from New Zealand to Korea back in 2001 and released his first solo album 7 years later. Tiger JK said that this song is about hope for the general public and for MFBTY. The reason why Feel Ghood Music had a quiet period after establishment was due to Tiger JK’s father’s passing in February. Suh Byung Hoo, was Korea’s first ever pop columnist and was Tiger JK’s best friend yet a high mountain that he could never climb over. Tiger JK has not cut his hair since his father passed, reminiscing of the times when his father used to pat his head. But he cannot sit still when his late father pushed him to go to the studio to work on his music, even the day before his passing. 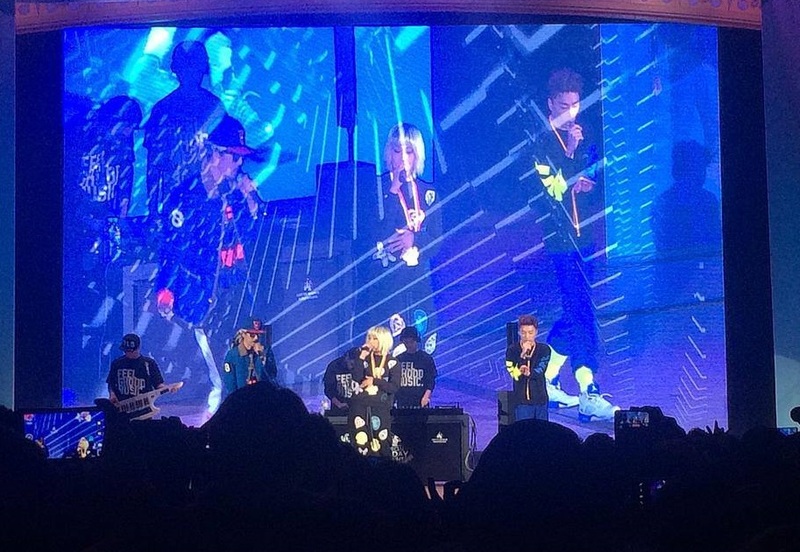 MFBTY Stated That Even If It Takes Longer Than the Norm, They Will Evolve. “Originally, the indie hip hop movement was an evolution, not a revolution. Even if we are small compared to all the other big companies, we will continue to evolve, staying true to our vision. Even if we make mistakes, we can make our own decisions in producing, marketing, promoting etc. We are in love with this stage of our music life right now. We still have passion for what we do,” Tiger says. Yoon Mi Rae confessed that she hoped that the label would do really well for her son’s sake. Bizzy said that Feel Ghood Music is his home whereas Yoon Mi Rae called Tiger JK her own hero. “Angel,” which has received lots of love, is just the tip of the iceberg for what Feel Ghood Music has planned ahead. Next month, they are hoping to release Bizzy’s new single. Every month, Feel Ghood Music is planning to release a new track, (much like Yoon Jong Shin’s monthly releases) to compete in the music industry. There will be a variety of genres too, not narrowed down to just hip hop. To be the best label in the world, be rich by being the best team, and to become a happy company spreading beautiful messages all over the world. That’s Feel Ghood Music’s vision. **”Misaeng” is a stone used in baduk that signifies the will to live. Whereas “wansaeng” is a stone that has finished its life and is dead. So by MFBTY referring themselves as misaeng, they are saying that they have the will to survive even though they have met trials and tribulations.